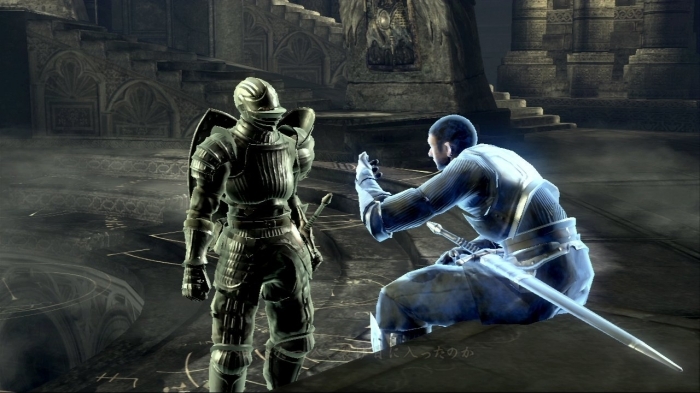 The author of this rather brief interpretation focuses on emphasizing the not-so-immediate and obvious features and characteristics of the game Demon's Souls. It is entirely possible that the majority of players that have experienced DS did not realize or even notice several of these unique elements that make this game so important and special. Which is the very reason I personally find this interpretation to be extremely valid and I was pleased to find another person that was as awestruck as I was when I first played it. The interpretation immediately draws comparisons to some other contemporary games such as Braid and Portal. The reason being, that Demon's Souls has been called a great ''dungeon crawler'' which the author finds inaccurate same as calling Portal a great FPS. The problem here is the vagueness of the terms that these specific games have given to their respective genres. FPSs are generally very similar to each other, you run, you shoot some guys, aim down the sights, etc. The only thing connecting Portal and say, Battlefield Bad Company 2, is the camera perspective and a crosshairs in the center of the screen. There aren't many, if any, games that would be similar to Portal in mechanics and fulfillment of the usual tropes that FPS genre brings. Same goes for Demon's Souls and the dungeon crawler genre it found itself categorized as. Strictly speaking it is a dungeon crawler, but the way the mechanics work is unlike anything current market can offer. And more importantly the main draw of Demon's Souls isn't exactly the promise of dungeon crawling, but rather the promise of exploration of one the best realized gaming worlds in the history of videogames and also the exploration of one's limits. Author then compares his playtime of some other games that he personally found to have an engaging and interesting world, coming to a conclusion that Demon's Souls is the game he has spent the most time with in his gaming career. He then explains the reason for this. The game is by no means larger than, by the author mentioned, Oblivion or Dragon Quest VII, indeed, Demon's Souls is quite short when it comes to JRPG standards (around 60 hours average). Demon's Souls can be finished in around 20 minutes, granted this time being a speed-run. It usually takes around 30-40 hours average, if the player just focuses on beating the levels and bosses. But rushing through the world is exactly the wrong way to experience Demon's Souls. I do not mean to sound dismissive, I do realize there are kinds of gamers that enjoy beating records and rushing through games, but it is my sincere belief, that games like Demon's Souls, of which there aren't many, should truly be explored and ''felt'' thoroughly. The interpretation details the sense of discovery and adventure one feels when delving into the various caves, ruins, mines and abandoned cities in Demon's Souls with no map or guide with the constant feeling of loneliness, hopelessness and danger. True enough, it's not the quality of graphics that stands out, colors are washed out and the entire game is extremely dark. It's the art design and level of detail of the environments that can be only summed up as bleak. The world is bleak, dying and lost. And it is this world that draws the players in until they have walked everywhere and seen everything. It is not necessarily the interactivity of the world that keeps things engaging, but it has more to do with the sense of place the game creates. Be it distant landscapes that the player will never explore, or the ''artificial silence'' humming away all around the player character. I found it strange there was no mention of the music or its lack thereof. During the exploration of the levels there is absolutely no music. Only the sound of battle, hits of the pickaxes of dreg miners, the singing zombie lady, the bell of the prison ward. And the sound of the environments, the wind, the sea and the various self-operating machines that have been left by the destroyed civilizations. The only time music appears are the boss fights. The article describes the boss fights quite appropriately. The game's ''trash'' mobs and normal enemies are so strong the boss encounters themselves do not appear as difficult as the journey to them. That is not to say they are easy. On the contrary few of the bosses pose one of the biggest challenges in the game. More on the bosses later. The music that plays during the boss fights tends to be very quiet and subtle giving off the sense of despair and slow and deliberate pace of the battle. There are some frantic tracks but those are rare exceptions. As if the game wishes to hint us that we are already dead and there is no point in even trying, as if the boss him/herself is bored of killing the player over and over. Also, the music is just scary, terrifying even and fits the overall theme of Demon's Souls perfectly. There is one more instance other than cut-scenes where music is present and that is when the player comes back to the only safe haven the game offers, the Nexus, which works as the central hub of the game world. The music here is...haunting. I personally found myself going back to Nexus for no other reason than to simply relax for a little, listening to the soothing, yet haunting music that actually makes the players linger in the Nexus longer than they normally would. The sadness of the world complemented by NPCs that have given upon their lives and the world they once inhabited, pessimistically dismissing the players efforts as meaningless, joined by the music that gives almost no comfort other than acknowledging the gravity and the truth of the situation the player finds himself in. He must advance, he must keep pushing, even though the entire world is against him. With this, the author has explained the first important aspect of Demon's Souls, the world, and how consistently realized it is. The next thing the author writes about is the morality of the game and the mechanics that reward or punish the player for his actions. The game makes the player ask himself what his motivations truly are and what do they mean to him. The player must defeat monsters and other enemies to reclaim their souls and use them in order to get stronger and get better equipment, essentially doing the exact same things as the demons themselves, figuratively becoming a demon himself. The more immoral actions player performs the blacker the world tendency gets. World tendency is the level of corruption the player brings with him into the various worlds (levels). World tendency can be lowered (towards black) by dying in body form and killing human (friendly, or at the very least not hostile) NPCs for their souls and loot. Tendency can also be raised (towards white) by defeating bosses, helping other players defeat the bosses and killing Black Phantoms (NPCs, or other players that have invaded the player's world in order to kill them). The whiter the tendency the less loot drops, enemies are weaker, more health player has and less souls drops from enemies, meaning the player isn't out be the strongest warrior but rather to help the world get rid of the demons. Conversely, the black tendency means more souls, more loot, the demons are much stronger and the player has much less health, effectively making the already sadistic world even harder to conquer, all the while enabling himself to get even stronger much faster. This system is so organic and natural, the players assume their ''roles'' in this Role Playing Game almost without their knowledge. There are no titles, guilds or quest but somehow, each player knows what his character's motivations are and what role he wants to take. When it comes to the aforementioned boss fights, the challenge comes in the journey to them, and eventually figuring out how to beat them, memorizing patterns and choosing the right equipment, it feels much more like a puzzle than a third person action adventure. The truly remarkable bosses however, are the arch-demons, the last bosses of the levels. Each of them do not really pose greater threat than any of the previous encounters be that a boss or trash mob. Arch-demons are a testament of the corruption greed and other human faults bring. One arch-demon, the Dragon God, seems very threatening give his size and general badassery, but the player comes to realize the demon is trapped withing the cave and has two ballistae aimed at his throat. The battle consisting of pulling two levers, rendering the demon helpless as he takes his last breaths resting his head on a cliff, where the player stands. Another demon is actually a pair of lovers, a knight protecting a priestess that sought only to help a leper colony the church has forsaken. After killing the knight, the priestess commits suicide and leaves her soul behind. Most of these encounters serve as a chance for the player to reflect on his motivations and actions. The last boss is probably the strangest of the bunch. Both I and the author expected an epic fight with the Old One, but the truth was very anti-climactic. Last boss was a shambling mess of a man that started the entire world-destruction-by-hungering-demons, and gave almost no resistance. After dispatching the late king, the main ally of the player, the Maiden in Black tells the player to leave as she performs the ritual to send the Old One back to his slumber. The Maiden being the strongest practitioner of the Soul Arts, the player cannot help but wonder what would happen should he kill her and claim her soul for himself. The game asks us to reflect upon ourselves one last time and decide what kind of person our character is. The article ends stating that the game plays with conventions and isn't afraid to pull off unusual scenarios (such as the undelivered last boss). Demon's Souls is truly memorable for being able to make the player feel he has ''been'' somewhere. And that he explored the place and now knows it. And remembers it. In my opinion, this is very well written interpretation that evokes the memories of this game vividly. While the article is much more valuable to a person that has played Demon's Souls (offering a possible new point of view of a familiar game) as opposed to those who haven't, I can imagine this piece of text would be enough to convince even the most adamant skeptics to give this game a chance and possibly look for these intricacies and appreciate them. Games should be examined for more than just the immediate entertainment and gratification and Demon's Souls is the perfect example.